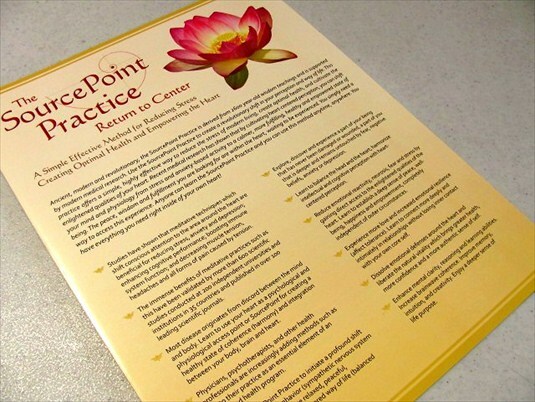 Click here to download a beautiful, full color instruction brochure for The SourcePoint Pratice. Ancient, modern and revolutionary, the SourcePoint Practice is derived from 2,600 year old wisdom teachings and is supported by modern medical research. The SourcePoint Practice is one of the finest methods we can use to create a revolutionary shift in our perception and way of life. The SourcePoint Practice, upon first glance, may appear very simple and elementary. However, it is actually one of the most highly effective methods for reducing the stress of modern living, creating optimal health, and for cultivating the enlightened qualities of the heart. Modern medical research has shown that by practicing heart-centered feeling and perception, we can shift our mind and physiology from anxiety-based activity to a calmer, more fulfilling, healthy and productive state of being. The peace, wisdom, and fulfillment humanity is seeking are within the heart, waiting to be experienced. Each person simply needs a way to access this experience. Anyone can learn The SourcePoint Practice. And we can use this method anytime, anywhere for life-changing results. We have everything we need right inside of our own heart! Please assist us in circulating The SourcePoint Practice around the world. You may download and freely distribute The SourcePoint Practice brochures from the link above. Provide this wonderful practice to friends, family, clients and patients, fellow students, hospitals, health clinics, schools, meditation centers and so forth. Send the SourcePoint Practice brochure out through your email lists, post it on your blog, publish it on social networking sites or put a link to this webpage on your website. The possibilities are limitless! Download the camera-ready art to freely print and distribute The SourcePoint Practice brochures in your country. 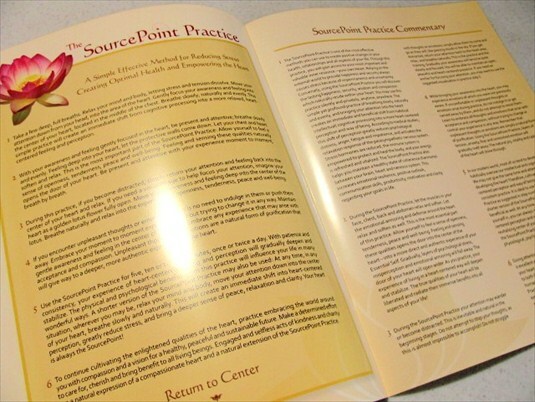 Please contact us if you would like actual hard copies of The SourcePoint Practice brochure. 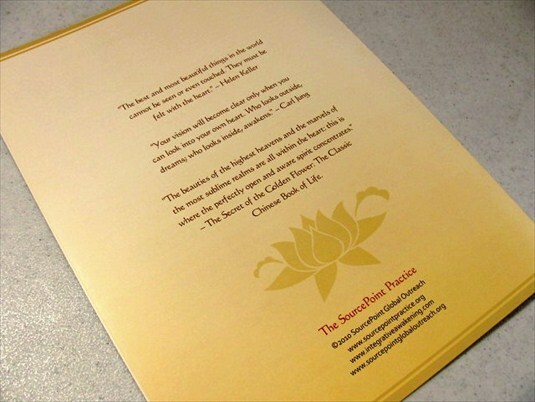 The brochure is exquisite, printed in full color on 100# gloss book stock, 4 pages, 8-1/2″x11″ in size. We provide the brochure at our exact cost of printing at .42 cents each, plus shipping. If you cannot afford to pay for the brochures, we will ship them to you for free. You may also download the print-ready file to the right if you would like to have these brochures printed in your own country for distribution. Print and distribute freely! Stay in touch! Sign up for updates on our newest projects.